In inviting me to write this article, I was asked by in a broad sense, “how is democracy present for you as an artist today?” With a short period of time and 1000 words to weigh in on this loaded question, I address it with my personal viewpoint acquired through working as artistic director of Teesri Duniya Theatre, a culturally diverse theatre, and as a political playwright. If democracy is a multiparty, one-person-one-vote system guaranteeing freedom, liberty, right to resist, and dispensing things of common good — Canada is a delightful democracy chockfull of parliamentary debate on a variety of issues, orders, disorders, delivering some sort of equality to men and women and equals and unequals alike. We are free to think. However freedom to think has not produced an ideological variety. Our democracy is restricted to ideologically similar parties supported by corporations pursuing corporate agendas. Slight deviation comes from cautiously left-leaning parties that have never formed the central government. By definition, democracy accommodates all groups of people no matter how unalike they may be from one another, which explains why Canadian democracy has accommodated a separatist party in Parliament whose agenda it is to break the country in the name of ethnocentric nationalism. However, despite a handful national, regional and issue based political parties, we also know that democracy is present in Canada because existing parties and the population basically believe in the same history — the history of “founding fathers” attempting to build the Canadian nation along same set of ideas, same goals and same aspirations. Two banners that the system has effectively used to mobilize masses in nation-building are the God and the flag. But contemporary Canada is more than founding fathers symbolizing bi-cultural Canada. Increasingly, many native born and new Canadians have joined First Nations Canadians in questioning past accounts of history. Many Canadians believe God and the flag means less or is an irrelevant yardstick of democracy and nation-building. In today’s time, a true democracy would be the one that takes into consideration previously eclipsed determinants such as cultural plurality, equality, race, languages, ethnicity, gender and differences. In absence of that, it is safe to say that we are stuck with a democratic government of the few i.e. white, Eurocentric, heterosexual male masquerading as a democracy. Let’s talk about democracy in context of arts and culture. To answer the initial question as to how democracy is present for me as an artist – I have to examine if democracy has resulted in recognition of diversity, plurality, and equitable public policies in the arts and cultural field. Are we governed by policies that treat all cultural strands equally? Do we have a mechanism that supports aesthetic quality of all cultural forms equally? Is same market value assigned to all artistic products regardless of cultural, racial and gender differences? Or is there a racial and cultural underpinnings in our policies that allow the “founding cultures” to be perceived as mainstream while the rest – Aboriginal people, mixed race, and Canadians of African, Asian, South Asian, Arab, Muslim and Latino descent — the “Other” are reserved to stay on the margins? I have the freedom to create what I believe is relevant and am passionate about. The Canada Council, our central arts body, is an equal opportunity institution and has policies in place for racial and cultural equality in the arts. This has provided me, to an extent, necessary conditions to create art. Presence of policy hasn’t however brought equality across cultures. Our art scene is still hierarchical in old terms of reference – Anglo-French, trailed by First Nations and other cultural strands. A larger question is how I use democracy in my own creations. Do I use the freedom democracy has offered me to create meaningful art that overcomes silence, addresses controversies, creates difficult works, and highlights minorities and the marginalized. The most important use of democracy is to overcome censorship; even more important is to overcome self-censorship. Democracy will not have any meaning if all it does is create safe theatre that is pleasing and consumable out of fear that the big theatres would not produce it. Recently, my play Bhopal was produced by the Teesri Duniya Theatre to a very successful run in Montreal. One of the world’s worst industrial disasters occurred in the city of Bhopal, India killing 25,000 people to date and counting. Thirty years after the disaster, survivors are suffering neurological and respiratory sickness, birth defects, disability and malformation among children. The play is a reminder that the frequency of industrial disasters is on the rise all over the world with recurring accidents of oil spills, pipeline leaks, dumping of hazardous chemicals and closer to home, the recent disaster at Lac-Mégantic. The Bhopal gas disaster happened because multinational corporations have relocated manufacturing to the developing countries where human rights laws are inadequate, wages are low and environmental regulations are virtually nonexistent. I see a close relationship between democracy, dramatization of human condition and creativity, which makes us aware of what is going on in the world we live in. And so, democracy works as the backbone of creativity that generates a consciousness. When artists are able to create consciousness — things happen. 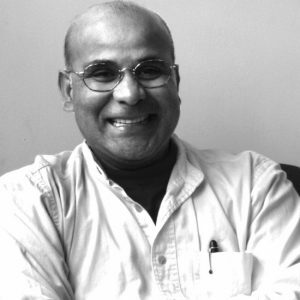 Rahul Varma is a playwright, essayist, and community activist and artistic director of the Teesri Duniya Theatre which he co-founded in 1981. He writes both in Hindi and English which is the language of his adulthood. He is one of only a few culturally diverse playwrights whose works have been translated and produced in French, Hindi and other languages. His recent works include Counter Offence and Bhopal, which was translated in Hindi as Zahreeli Hawa by India’s preeminent director Habib Tanvir.